We have already discussed the Mid-Point circle drawing algorithm in our previous post.In this post we will discuss about the Bresenham’s circle drawing algorithm. 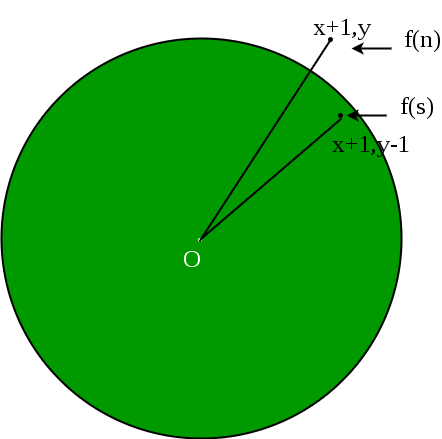 Now, we will see how to calculate the next pixel location from a previously known pixel location (x, y). In Bresenham’s algorithm at any point (x, y) we have two option either to choose the next pixel in the east i.e. (x+1, y) or in the south east i.e. (x+1, y-1). 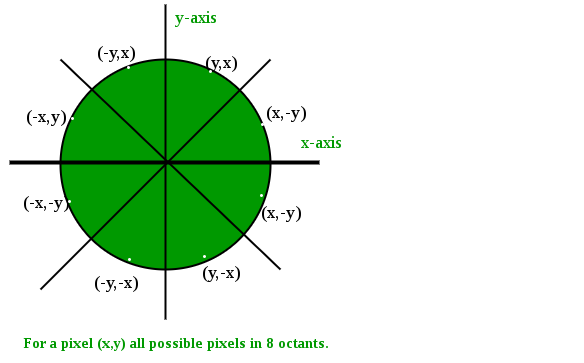 If d > 0, then (x+1, y-1) is to be chosen as the next pixel as it will be closer to the arc. else (x+1, y) is to be chosen as next pixel. Set decision parameter d to d = 3 – (2 * r). call drawCircle(int xc, int yc, int x, int y) function. Else, set d = d + 4 * (x – y) + 10 and decrement y by 1. Below is C implementation of above approach. This article is contributed by Shivam Pradhan (anuj_charm). If you like GeeksforGeeks and would like to contribute, you can also write an article using contribute.geeksforgeeks.org or mail your article to contribute@geeksforgeeks.org. See your article appearing on the GeeksforGeeks main page and help other Geeks.